Cherries, Cherries, Cherries - "Fiesta Cherries"
So... what have I been up to? I've been painting Cherries! One of our local stores had a sale of the most beautiful succulent cherries I've seen in a long while! I just couldn't resist grabbing a handful and posing them... I didn't capture the steps this time. I know some of you really like seeing the steps so I promise to get back into the groove of doing that in August. 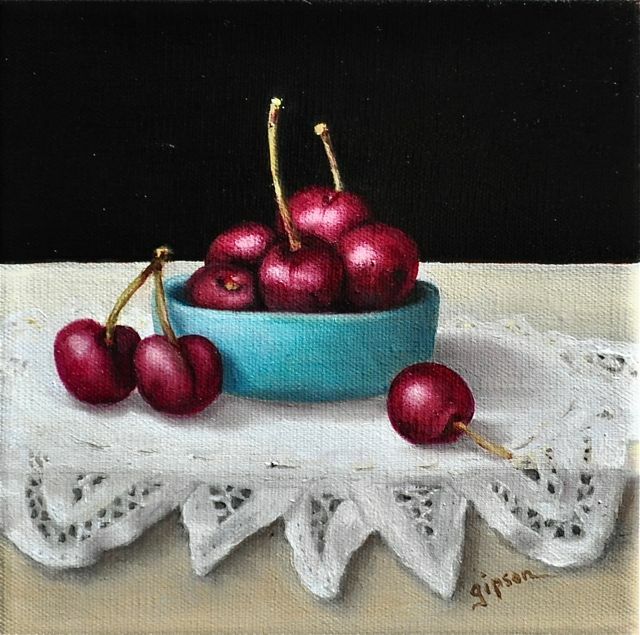 "Fiesta Cherries" is on 6x6 linen. The cherries are piled in the small bowl - typically found in the center of a vintage Fiesta relish dish - in this case the piece represented is vintage turquoise blue.